The minimum wealth needed to qualify for this year’s 300 richest people in Ireland is €57 million. THE COMBINED WEALTH of Ireland’s wealthiest people has grown by 10% in the last year, according to the Sunday Times Rich List which was published today. 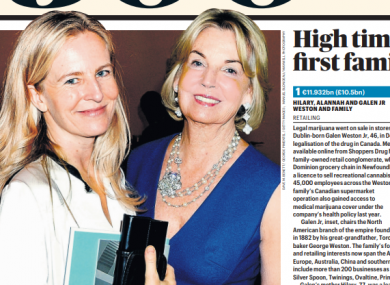 Top of this year’s list of Ireland’s 300 wealthiest people for the 11th successive year is Dublin-born Hilary Weston and family which has global retail and hospitality assets valued at €11.9 billion – up €512 million from last year. Their wider chain of companies include stores Primark (Pennies), Brown Thomas and Selfridges. Coming in second this year are Stripe founders brothers Patrick and John Collison with a joint estimated fortune of €5 billion – up €2.6 billion from 2018 making John Collison the youngest euro billionaire. The minimum wealth needed to qualify for this year’s 300 richest people in Ireland is €57 million, up from €52 million in 2018. With 33 new entrants on this year’s list, the combined wealth of the 300 stands at €87 billion. Businessman Dermot Desmond comes in 5th on this year’s rich list with an estimated fortune of just over €2 billion while telecommunications billionaire Denis O’Brien’s wealth has dropped by €1.8 billion placing him in 6th. Strong performers on this year’s list include golfer Rory McIlory (€157 million) and MMA fighter Conor McGregor (€115 million). U2 topped the list of Ireland’s wealthiest entertainers this year with an estimated wealth of €662 million and have increased their worth by €15 million compared to last year, according to the Sunday Times. This follows a 60-date tour of North America and Europe that sold 923,000 tickets and grossed €113m – making them one of the highest-earning acts in the world last year. Liam Neeson, Enya and Sir Van Morrison also feature on the list, while Bob Geldof is a new entry to this year’s entertainment top 10, at eighth place, with an estimated value of €57m. Niall Horan and Sir Daniel Day-Lewis are on the list of Ireland’s top 10 richest entertainers – but both fall just short of the €57m entry point for the overall 2019 list of Ireland’s richest 300. Email “Wealth of Ireland's super rich rises in the latest Sunday Times Rich List”. Feedback on “Wealth of Ireland's super rich rises in the latest Sunday Times Rich List”.